The next weeks ahead will feature several very talented suspense author's as guest-hosts for my blog. Prepare yourself for some fun this month. I'm looking forward to hearing what these amazing authors say. This is the first book featured in October's "A Season of Suspense." 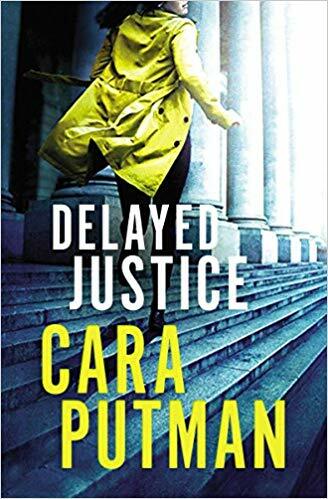 I had the pleasure of reading an Advance Reader's copy of author Cara Putnam's latest thriller, Delayed Justice. Here is my review of her novel. "She had long given up the desire to be loved. Now she needed to be heard." This is Author Cara Putnam's tagline for her new novel which is out in pre-order and available on October 16th. 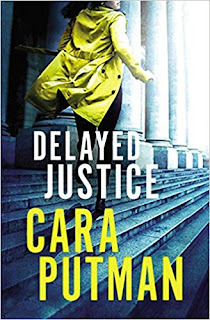 Ms. Putnam writes a smart, believable, legal thriller. She delves into the subject of an adult coming-to-terms with a horrible act done to her by a family member during childhood. The writing is succinct, and crisp, which treats this sad subject matter in a caring manner. I enjoyed reading each page and looked forward to reading her novel after a long, busy day. If you enjoy suspense, and legal thriller, you need to add this book to your reading list. I received a paperback copy of this book from the publisher and was under no obligation to post a review or blog about her novel. The words written in this review and placed on my blog are solely mine. Pour yourself a cup of coffee or tea and settle in with a great book! What kinds of books peak your interest? Romance? Suspense? Fantasy?